60 · The Devil in the Summer-House · John Dickson Carr · pl; first broadcast by the BBC on October 14, 1940. 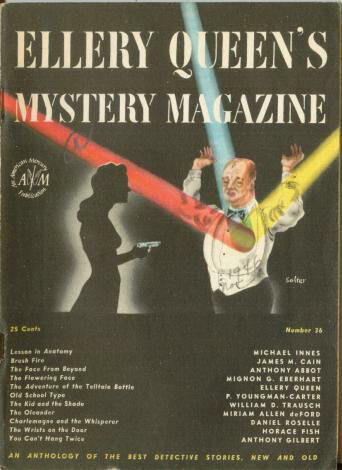 This is the shorter version without Dr. Fell which was broadcast on the CBS Suspense program, November 3, 1942. 45 · The Safe of the S.S.S. [Joseph Leborgne] · Georges Simenon; translated by Anthony Boucher · ss; translated from the French (Les 13 Mystères, 1932). 69 · The Old School Type · P. Youngman-Carter · ss Gen 19?? 72 · The Kid and the Shade · William D. Trausch · ss The Guidon 19?? 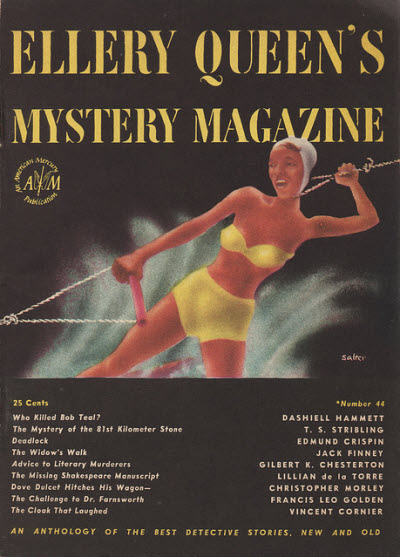 4 · The Clue of the Tattooed Man [The Great Merlini] · Clayton Rawson · ss; contest story, lacking the final half pagesolution in March 1947 issue. 61 · Professional Début [Máximo Roldán] · Antonio Helú; translated by Anthony Boucher · ss; translated from the Spanish (La Obligacion de Asesinar, 1946). 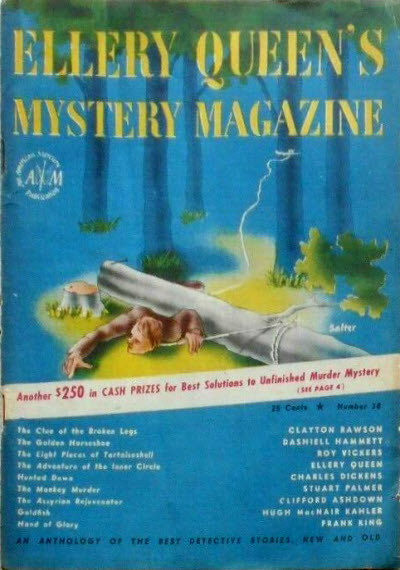 4 · The Clue of the Broken Legs [The Great Merlini] · Clayton Rawson · ss; contest story, lacking the final half pagesolution in April 1947 issue. 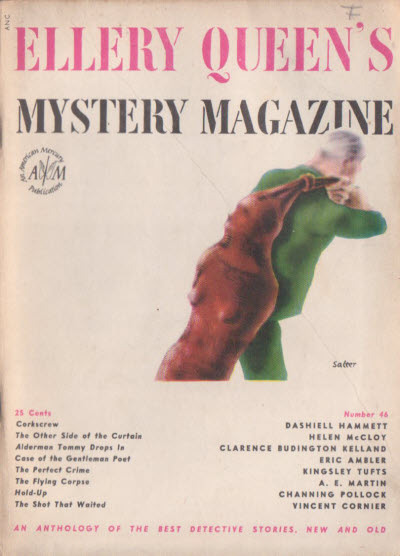 92 · Goldfish [Carney] · Hugh MacNair Kahler · vi Colliers Jul 8 1933; previously in EQMM Overseas Edition January 1946. 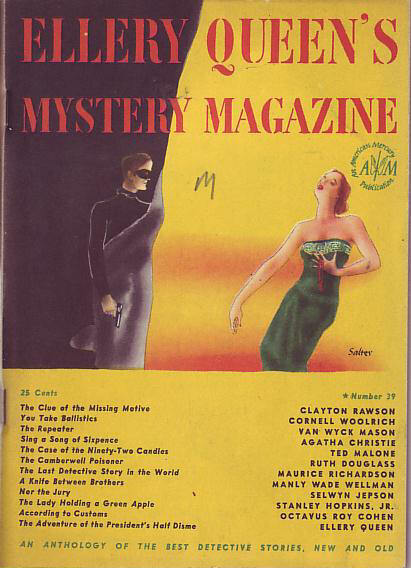 4 · The Clue of the Missing Motive [The Great Merlini] · Clayton Rawson · ss; contest story, lacking the final half page. 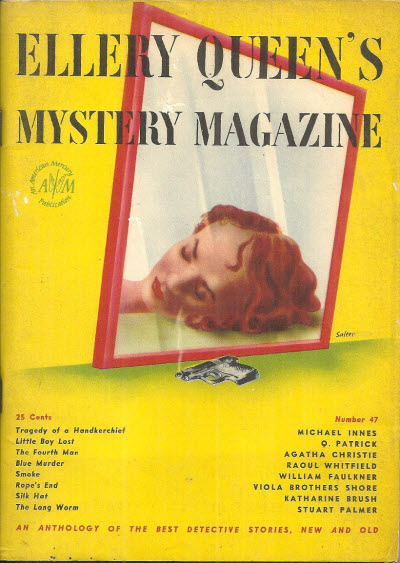 Solution in May 1947 issue. 54 · The Case of the Ninety-Two Candles [Sherlock Holmes] · Ted Malone · fa; first broadcast on ABC radio, January 7, 1946. 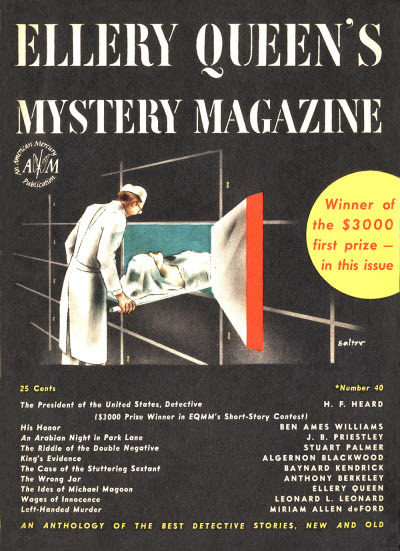 64 · Kings Evidence · Algernon Blackwood · ss London Calling Jan 9 1941; first broadcast on the BBC, June 27, 1936.; a rewritten version of Confession (Century Magazine, March 1921). 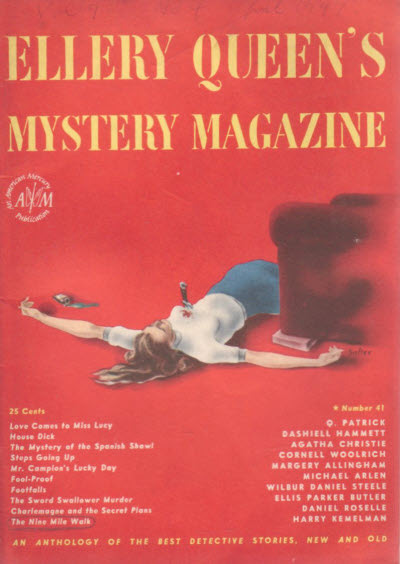 70 · The Case of the Stuttering Sextant · Baynard Kendrick & Clayton Rawson · fa; Kendricks story is a satire on true crime stories, and Rawson provides an introductory spoof of Dannays lengthy prefaces in EQMM, as well as mock footnotes. 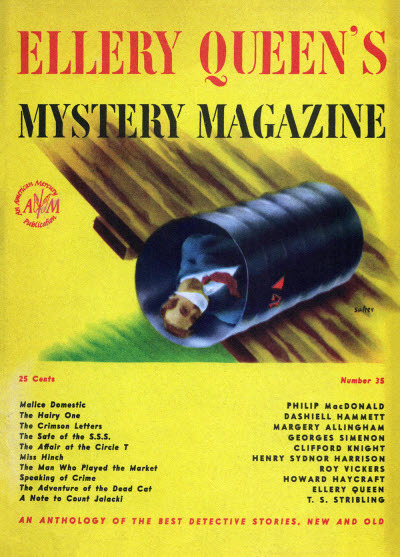 76 · The Wrong Jar [Roger Sheringham] · Anthony Berkeley · nv Detective Stories of Today, ed. Raymond Postgate 1940; abridged. 125 · Solutions to the First Monthly Contest · Clayton Rawson · ms; final paragraphs of The Clue of the Tattooed Man plus a list of contest winners. Given as v9 #4 in the Table of Contents. Details supplied by Douglas Greene. 125 · Solutions to the Second Monthly Contest · Clayton Rawson · ms; final paragraphs of The Clue of the Broken Legs plus a list of contest winners. 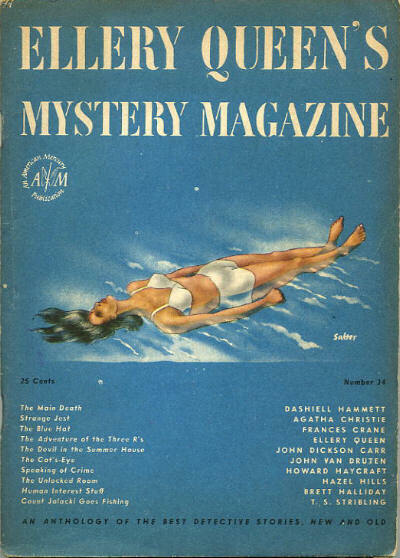 88 · The Tracy Enigma [G.7] · Georges Simenon; translated by Anthony Boucher · ss; translated from the French (Les 13 Enigmes, 1932). 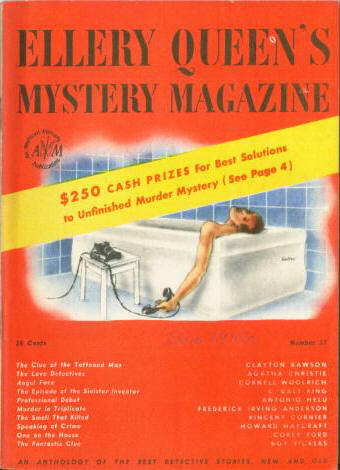 126 · Solutions to the Third Monthly Contest · Clayton Rawson · ms; final paragraphs of The Clue of the Missing Motive plus a list of contest winners. 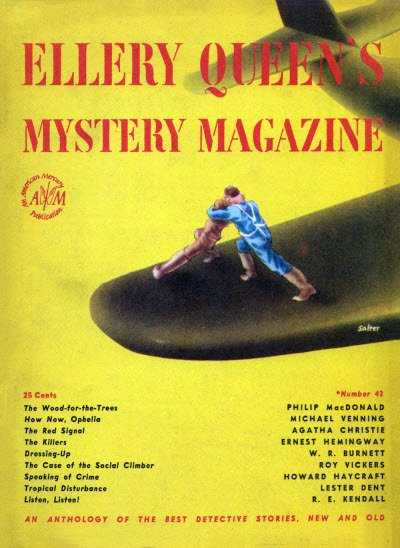 16 · The Quarterdeck Club [Simon Templar (The Saint)] · Leslie Charteris · nv; radio script adaptation. 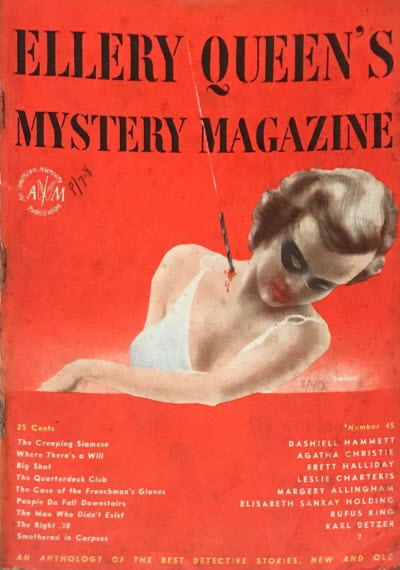 64 · Smothered in Corpses · Ernest Bramah · ss The Living Age Sep 27 1919, as Smothered in Thrills: A Burlesque for the Cinema; given as by ? on the story itself, with the authors name given on p. 72. 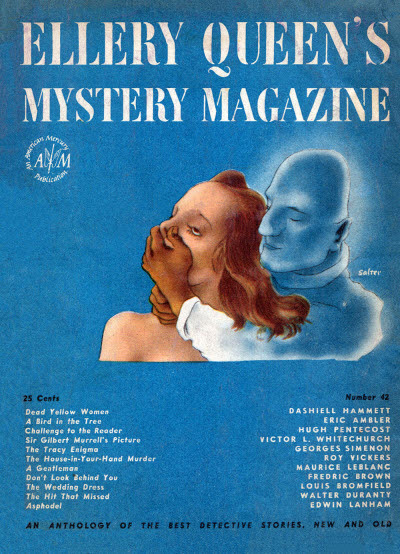 16 · Blue Murder [Don Free] · Raoul Whitfield · nv Black Mask Sep 1932; not the same as the story of the same name in the July 1928 issue.